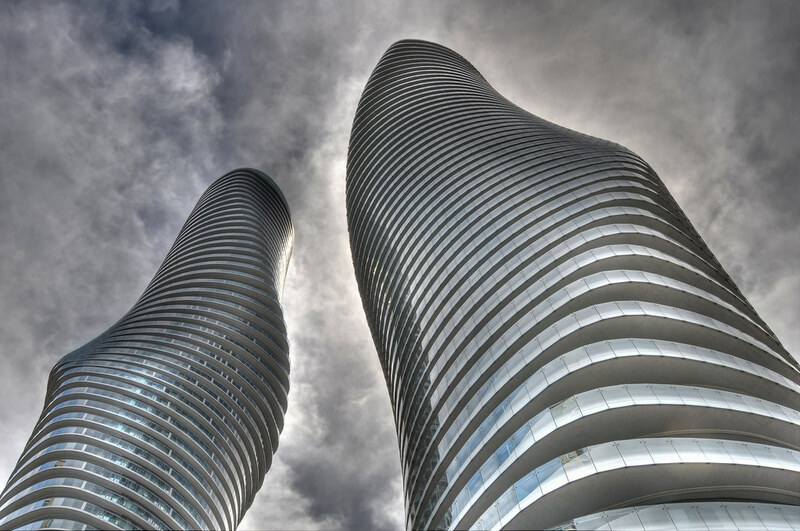 Mississauga Absolute World condos received a major accolade this past week, when the Council on Tall Buildings and Urban Habitat, a prestigious Chicago-based not-for-profit organization, named them the best new tall buildings in the Americas for 2012. The CTBUH awarded four global winners in total, from four separate geographical regions. Buildings were chosen for their design and technical innovations, their sustainable characteristics, the enhancement they provide to the cities where they are located, and the enhancement they provide to the lives of the citizens in those cities. The four winners for 2012 will be honoured, and awards will be given out, at the CTBUH 11th Annual Awards Ceremony which is scheduled to take place at the Illinois Institute of Technology in Chicago, on October 18th, 2012. On the night of the ceremony, in addition to the four regional awards, from these, one overall winner will be selected, and will be awarded with the title of “Best New Tall Building Worldwide” for 2012. The ‘Best in the Americas’ award just bestowed on ‘Marilyn’, and the recognition that goes with it, only confirms what the citizens of Mississauga already know – that the Absolute World condominiums, the ‘Marilyn Monroe’ towers of Mississauga, are two of the most exhilarating real estate developments in recent memory, that provide a daily delight to the senses for anyone lucky enough to see them on an everyday basis. The Mississauga skyline will never be the same. Congratulations to the development team at Fernbrook/Cityzen, to Dominus construction, to everyone who bought at these fabulous condos, and to the City of Mississauga! And good luck in October – winning the overall “best new tall building in the world” for 2012 would be well deserved! Mississauga condos will be the topic of conversation today, but in a general sense. The newspapers have written much regarding the shift to condo living in Canada, and indeed, condominiums are the fastest growing type of new construction in the Greater Toronto Area, having been embraced by a wide segment of the buying public. In recent years even some of the larger suburbs such as Mississauga have shown a shift to high rise condo living. Today, especially in the Square One area, there is an astounding range of newly built towers, with thousands of units sold or rented to a seemingly unending supply of new customers. Condominiums offer a great lifestyle, but also come with some restrictions that are worth considering before making a decision to move. Here are some of the pros and cons. Maintenance Free Lifestyle: If you are not handy with house repairs, condos offer a near maintenance free lifestyle. Many of the major components of a house, such as the furnace, the roof, grounds keeping, snow removal, etc., are all taken care of for you in a condo. Security: most better condos have a concierge or security at the front door, with cameras usually providing extra security throughout the complex. When you travel, simply close and lock your unit door, and no one will know that you are away. Amenities: most condos contain amenities that would be very difficult and expensive to duplicate at a private, freehold residence. Indoor and outdoor swimming pools, gym, pilates rooms, squash, racquetball and tennis courts are often found, and some complexes boast home theatre rooms, and even bowling alleys, and rock climbing walls. Views: many condos today are 30, 40, 50 storeys and higher, and many units have incredible views which can’t be duplicated from a 2 storey residence. Lifestyle: there is no doubt that many of today’s condos offer a lifestyle that is truly of the ‘rich and famous’. Affordability: many condos are available at a price which first time buyers can afford. Today’s prices for freehold properties are out of reach for many buyers. Space: most condos have a smaller square footage than the average house, so if you have a lot of belongings, this can be a consideration. Twenty years ago, the average 2 bedroom unit was about 1000 square feet, and today this is closer to 750 square feet. Limited Locker Storage: although the space issue is somewhat mitigated in that many condos also include a storage locker, usually these are only big enough for items such as bicycles. Maintenance Fees: condominiums have a monthly maintenance fee, which is typically used to pay for ongoing maintenance such as landscaping or snow removal, building insurance, plus a portion which contributes to a long term savings fund (the ‘reserve fund’), which is used for future repairs and updates to the property. Some, but not all maintenance fees include the various utilities (heat, hydro, and water). Restrictions on Renovations: almost every condo will allow you to make cosmetic changes to the inside of your unit, but special permission is often required for changes which can impact your neighbours, such as adding hardwood floors, and most condo corporations will not allow you to make changes to the exterior of your unit, or any work which would move the walls (load-bearing structures). Restrictions on pets: some condos allow pets, some allow pets under a certain weight, and some do not allow them at all. Gardens and Barbecues: if you like to garden, or you like to barbecue: some condos will allow you to have a small barbecue on your balcony, but many won’t. Some of the newer projects have barbecue areas which you can use – but these are located in the common areas of the building, and not in your own private backyard. As for gardening, you can have window boxes with some flowers and plants, but if gardening is your passion, then condos may not be a good fit for you. Check it out to find a comprehensive review of the Mississauga condo scene, with further links providing detailed information on the individual Square One properties. How Long will the Toronto Real Estate Slump Last? Join My Professional Network on Linkedin!